All of our historical figures are available as life size cutouts, vinyl Wall graphics, or as an acrylic statuettes. Each product is printed from the same graphic shown on the website and contour cut. To learn more about our products and materials select one below. We have been the leading historical based cutout supplier for nearly 10 years. We have worked with many schools, museums, and colleges across the country to provide stunning graphics from hsitory. 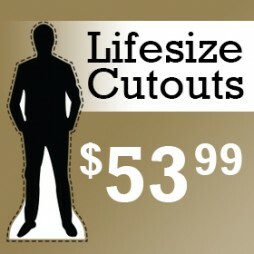 Historical Cutouts are available in 3 materials and come contour cut with an easel to be self standing. Click below to learn more about each material and our cutout process. All of our historical figures are available as a life size wall graphic. 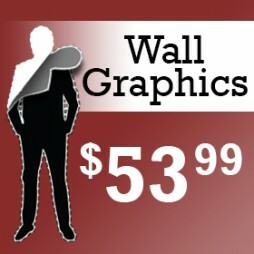 Vinyl wall graphic orders come ready to apply with squeegie and instructions. Having trouble? Check out our how to youtube video. Our graphics are printed on tear resistant PhotoTex Vinyl using our high definition 4 color plus white printing process. 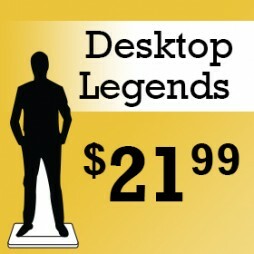 Desktop Legends are a smaller version of our life size cutotus printed on 3/16th" acrylic. All of our cutouts are also available as a desktop legend . Statuettes come in two sizes, 8" and 12". If you would like to learn more please click below.